Time for dinner! The recipe that I would like to introduce is called Bang Bang Shrimp Tacos. 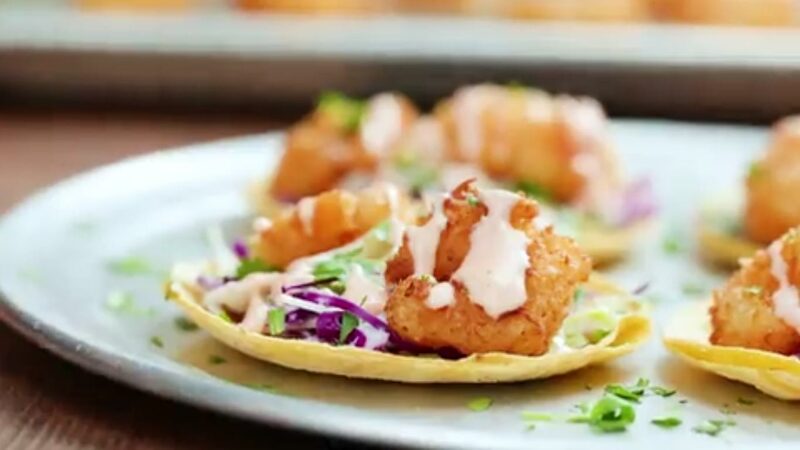 Crunchy, sweet and with just a lil bit of bite, these tasty shrimp tacos hit the spot every time. 1. To make the slaw, combine cabbage, sour cream, mayonnaise, cilantro, garlic, lime juice and salt in a large bowl; set aside. 2. For the sauce, whisk together mayonnaise, sweet chili sauce, honey and Frank’s Hot Sauce in a small bowl; set aside. 3. In a large bowl, whisk together coconut milk, flour, cornstarch, egg and hot sauce, and season with salt. 4. Mix the panko and the shredded coconut. Dip the shrimp into coconut mixture, then dredge in panko, pressing to coat. 5. In a skillet, heat oil to medium-high. Working in batches, add shrimp to the skillet and cook until evenly golden and crispy, about 2 to 3 minutes each. Transfer to a paper towel-lined plate to drain excess oil. 6. To assemble, warm the tortilla and add coleslaw, shrimp, and top with sauce.